Signed as New York 878, Interstate 878 overlays the portion of the Nassau Expressway built with Interstate Highway funds. The route officially totals just 0.70 miles in length, making I-878 the shortest Interstate in the system. The Nassau Expressway is an eastbound-only roadway from NY 27 (Conduit Boulevard) at Ozone Park to Interstate 678 (Van Wyck Expressway) on the north side of John F. Kennedy International Airport (JFK). Westbound lanes accompany Nassau Expressway from Rockaway Boulevard to Belt Parkway ahead of the Van Wyck Expressway. The I-878 mileage references just the dual roadway section east of I-678. Originally planned to be part of Interstate 78 extending southeast from Lower Manhattan through Brooklyn to Queens, the Nassau Expressway opened in 1971 as a one-way eastbound freeway. The proposed alignments for I-78 through Brooklyn and Queens were eliminated in 1971, but the Nassau Expressway segment remained signed as I-78 until 1989.1 AASHTO previously deleted I-78 along the Nassau Expressway on June 23, 1969, opting to redesignate it as Interstate 878. The unconstructed westbound lanes of I-878 were scrapped in 1981 due to community opposition and other issues. The one-way segment extends between Cross Bay Boulevard and Interstate 678 (Van Wyck Expressway) just south of the Belt (Southern) Parkway. East of I-678, both directions were built to a jug handle intersection with Hangar Road. Nassau Expressway extends southeast from there as an at-grade road into Nassau County as Rockaway Boulevard. 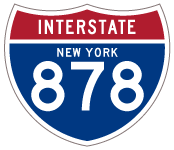 Although not shielded, NYSDOT reference markers identify the route as “878I” for the freeway portion within the vicinity of Interstate 678 and John F. Kennedy Expressway. The I suffixed on NYSDOT reference markers identifies an Interstate highway. According to Steve Anderson’s site, I-878 shields were posted in 1989 when the Interstate designation was first confirmed. Prior to the renumbering of Interstates 278 and 895 in Bronx, New York by AASHTO on June 23, 1969:, the Interstate 878 designation was reserved for the Bruckner Expressway east from the Sheridan Expressway (I-895) to the Bruckner Interchange with I-95. During that time period, Interstate 278 followed the Sheridan Expressway north to the Cross Bronx Expressway. It was proposed to extend 5.2 miles further along an alignment over U.S. 1 (Boston Post Road) northeast to Interstate 95 at the New England Thruway. The Sheridan Expressway extension however was dropped in 1971, along with several other metropolitan expressway proposals.2 I-278 was instead realigned over planned I-878 and the small section of the Sheridan Expressway was redesignated as Interstate 895. For more, visit Steve Anderson’s Sheridan Expressway. Traveling east from Interstate 678, New York 878 (Nassau Expressway) crosses paths with John F. Kennedy Expressway. JFK Expressway is an unnumbered highway connecting the JFK Airport passenger terminal with Belt Parkway. Photo taken 08/29/05. Curving southeast around the periphery of JFK Airport, NY 878 (Nassau Expressway) next meets North Hangar Road south (Exit 3) to North Boundary Road and air cargo facilities. Photo taken 08/29/05. Nassau Expressway expands to six overall lanes at the forthcoming jug handle intersection (Exit 3) with North Hanger Road. Photo taken 08/29/05. Nearing the turn off for North Hangar Road on NY 878 (Nassau Expressway) east. Cancelled plans called for the continuation of the Nassau Expressway southeast along Rockaway Boulevard toward Atlantic Beach. Photo taken 08/29/05. Eastbound NY 878 at the Exit 3 turn off for North Hanger Road into JFK Airport. The expressway transitions to Rockaway Boulevard a short distance ahead at Farmers Boulevard. Photo taken 08/29/05. New York 878 branches west from Rockaway Boulevard along Nassau Expressway from the intersection with Farmers Boulevard. Photo taken 06/26/05. West from Hanger Road, there are no off-ramps along New York 878 (Nassau Expressway) to the freeway end at Belt Parkway. The unsigned Interstate passes under John F. Kennedy Expressway and 150th Street in this scene. Photo taken 08/29/05. The Nassau Expressway westbound lanes follow what likely would have been a collector distributor roadway for John F. Kennedy Expressway and Belt Parkway. The roadway winds northward, spanning Conduit Avenue (NY 27) and the Belt Parkway mainline ahead of a slip ramp for I-678 north. Photo taken 08/29/05. Motorists headed to the Van Wyck Expressway north initially merge with traffic from the Belt Parkway westbound ramp to I-678 and 133rd Avenue. The Van Wyck Expressway travels north to Kew Gardens and Flushing Corona Park to the Whitestone Expressway. Photo taken 08/29/05. Replaced button copy signs at the NY 878 merge with the ramp system (Exit 19) from Belt Parkway west to 133rd Avenue and I-678 north. Photo taken 08/29/05. Two lanes continue onto a c/d roadway extending north along Interstate 678 to Rockaway Boulevard. A frontage street connects with 133rd Avenue to South Ozone Park. Photo taken 08/29/05. New York 27 follows the initial segment of the Nassau Expressway as it branches southeast from Conduit Avenue. The state route returns to Conduit Avenue ahead of Lefferts Boulevard, forming the south frontage road for the Belt Parkway east to Nassau County. Photo taken 08/29/05. New York 878 (Nassau Expressway) east connects New York 27 with Interstate 678 (Van Wyck Expressway) and John F. Kennedy International Airport (JFK). Photo taken 08/29/05. Exit 19 leaves the Belt Parkway eastbound for a flyover spanning both NY 27 and NY 878 ahead of Lefferts Boulevard. Photo taken 08/29/05. Eastbound New York 878 (Nassau Expressway) shifts northward through an industrial area ahead of the directional cloverleaf interchange (Exits 1S/N) with Interstate 678 (Van Wyck Expressway). Photo taken 08/29/05. Exit 1S curves southward onto Van Wyck Expressway ahead of general aviation and rental car facilities of JFK Airport. I-678 ends as the airport boundary, with the freeway continuing to the passenger terminals. Photo taken 08/29/05. A two-lane loop ramp (Exit 1N) takes drivers from New York 878 (Nassau Expressway) east to Interstate 678 (Van Wyck Expressway) north. Photo taken 08/29/05. A left-hand ramp from Interstate 678 southbound connects with both NY 878 (Nassau Expressway) east the Belt Parkway and NY 27 (Conduit Avenue) east. Photo taken 06/26/05. Exits 1 and 1E constitute slip ramps onto the Van Wyck Expressway northbound off-ramps for Nassau Expressway and Belt Parkway. Photo taken 06/26/05. Interstate 678 (Van Wyck Expressway) passes under the Red and Green AirTrain transit lines and splits with a two-lane off-ramp (Exit 1A) for New York 878 (Nassau Expressway) and the Belt Parkway east to Long Island. Photo taken 08/29/05. New York 878: Nassau Expressway. NYCRoads.com. Page updated October 11, 2017.